COMPUTEX Taipei & Fountain Valley, CA – May 25, 2017 – Kingston Digital, Inc., the Flash memory affiliate of Kingston Technology Company, Inc., the independent world leader in memory products, today announced KC1000 NVMe PCIe SSD. Shipping in mid-June, the M.2 NVMe™ PCIe SSD is over 2x faster than SATA-based SSDs and over 40x faster than a 7200RPM hard-disk drive. KC1000 is built for the power user, providing the ultimate, low-latency performance boost for resource-demanding applications including high-resolution video editing, data visualization, gaming and other data intensive workload environments where traditional storage solutions are unable to keep pace with data demand. KC1000 is backed by a limited five-year warranty and legendary Kingston support. 1 Some of the listed capacity on a Flash storage device is used for formatting and other functions and thus is not available for data storage. As such, the actual available capacity for data storage is less than what is listed on the products. For more information, go to Kingston’s Flash Memory Guide at Kingston.com/flashguide. 2 Based on “out-of-box performance” using a SATA Rev. 3.0 / PCIe Gen 3 motherboard. Speed may vary due to host hardware, software, and usage. IOMETER Random 4K Random Read/Write is based on 8GB partition. 4 Limited warranty based on 5 years or “SSD Life Remaining” which can be found using the Kingston SSD Manager (Kingston.com/SSDManager). A new, unused product will show a wear indicator value of one hundred (100), whereas a product that has reached its endurance limit of program erase cycles will show a wear indicator value of one (1). See Kingston.com/wa for details. Kingston Digital, Inc. (“KDI”) is the Flash memory affiliate of Kingston Technology Company, Inc., the world’s largest independent manufacturer of memory products. Established in 2008, KDI is headquartered in Fountain Valley, California, USA. For more information, please visitwww.kingston.com or call 800-337-8410. STOW, OH, May 23, 2017 - Audio-Technica is now shipping its ATH-DSR7BT Wireless Headphones with Pure Digital Drive technology. 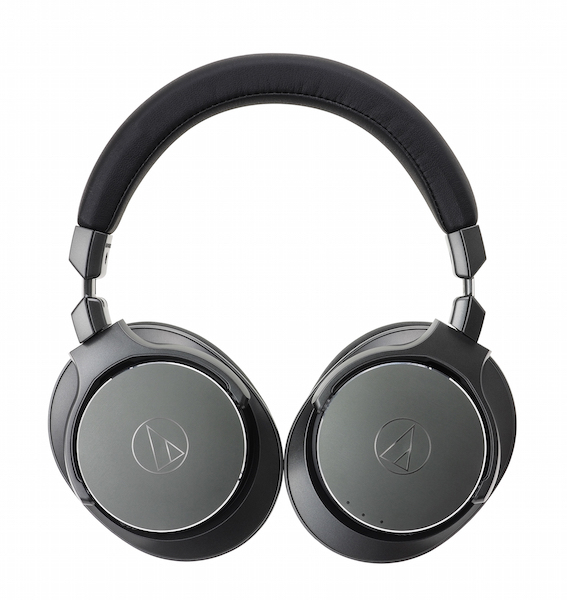 The ATH-DSR7BT is one of the first headphones with Bluetooth wireless technology to employ Audio-Technica's new Pure Digital Drive system, which keeps the audio signal completely digital from source to driver to offer never before-available wireless headphone sound quality. Typically, in headphones using Bluetooth wireless technology, the digital signal goes through a series of steps that process and transform the wireless signal. With each processing step, there's an opportunity for distortion and disruption in the audio quality. With the Pure Digital Drive system used in the ATH-DSR7BT, Audio-Technica uses the Trigence Semiconductor Dnote® chipset instead of a traditional D/A converter and amplifier. This keeps the audio signal entirely in the digital domain from the source right through to the driver, thereby eliminating the opportunities for disruption or distortion. The ATH-DSR7BT is built upon the design and engineering of the award-winning ATH-MSR7. It employs a re-engineered 45 mm True Motion Driver with a lightweight bobbin-wound voice coil and a specially designed diaphragm to improve the transient response of the driver. A pair of acoustic resistors controls the airflow around the diaphragm to ensure a natural, balanced sound. The headphones' printed circuit board is mounted away from where it could interfere with the driver's acoustic response, and a layered aluminum housing reduces unwanted vibration and controls internal airflow for maximum audio clarity. The Pure Digital Drive system also enables the ATH-DSR7BT to overcome the sonic limitations of conventional Bluetooth transmission. The headphones support aptX® HD, aptX and AAC codecs (as well as the SBC format) at up to 24-bit/96kHz and up to 24-bit/48kHz signals in Bluetooth mode. The ATH-DSR7BT features NFC (Near Field Communication) functionality for ready pairing with an NFC-compatible device. It also features a built-in mic and controller for answering calls and controlling volume and music playback. The ATH-DSR7BT is able to deliver Hi-Res Audio compliant playback from audio sources when connected via its included USB cable. All the controls and indicators are mounted on one of the earcups for ready access. Three LED indicators provide pairing and charging status, battery level and indication of the codec in use. The ATH-DSR7BT features soft formfitting foam earpads and a padded headband for total long-wearing comfort. Its rechargeable battery provides 15 hours of continuous use (1,000 hours standby). 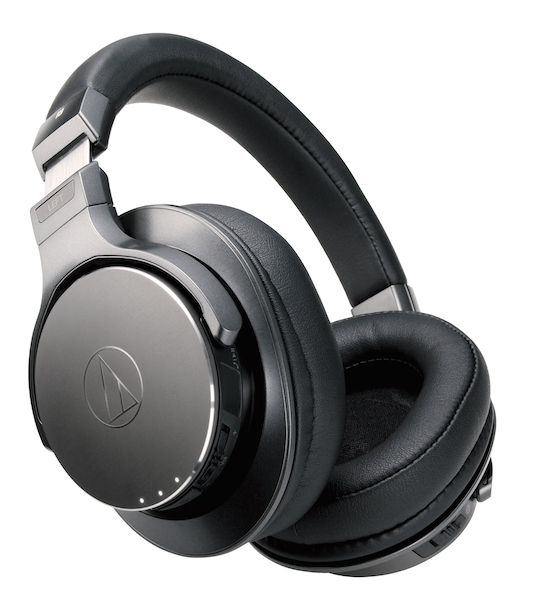 The Audio-Technica ATH-DSR7BT Wireless Headphones with Pure Digital Drive Technology are currently available at $US299.00. Click here for ATH-DSR7BT product profile and downloadable high-res photos. - Audio-Technica Promotional Video: "Always Listening to the Music That Moves Us"
Celebrating over 50 years of audio excellence, Audio-Technica is a recognized leader in the development and manufacture of high-quality personal and professional audio equipment. Founded in Japan in 1962 by Hideo Matsushita, the company made its name by manufacturing state-of-the-art phonograph cartridges and tonearms. Today, Audio-Technica is a worldwide group of companies devoted to creating high-performance microphones, headphones, wireless systems, mixers, turntables, phono cartridges and other electronic products. A reputation for quality, durability, performance and value has made Audio-Technica products the first choice for many of today's top musical artists and audio engineers, and for discerning listeners everywhere. 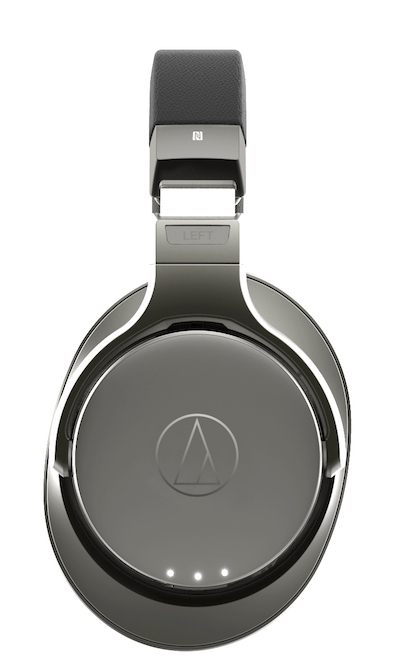 Drawing from its audiophile heritage, Audio-Technica remains dedicated to providing music enthusiasts with great-sounding, innovative audio gear, including the award-winning QuietPoint® active noise-cancelling headphones, popular ATH-M50x monitor headphones, versatile USB microphones, and new Hi-Res Audio headphones and high-fidelity gaming headsets. Learn more at www.audio-technica.com. Brooklyn, NY (May 17, 2017) - Pro Sound Effects®, the next level sound effects library company, today released the Master Library 2017 - an upgraded version of their most comprehensive general sound library. Now offering more than 200,000 royalty-free sound effects with metadata optimized for pinpoint search, the new Master Library 2017 also provides users with full online access, free annual updates, and search software. Totaling over 1,700 hours of diverse, professional quality sound effects spanning 293 categories, the Master Library 2017 features newly added sounds from world-class recordists. This includes the latest specialty library releases from Pro Sound Effects such as "Cinematic Winds" by film sound legends Alan Splet and Ann Kroeber. 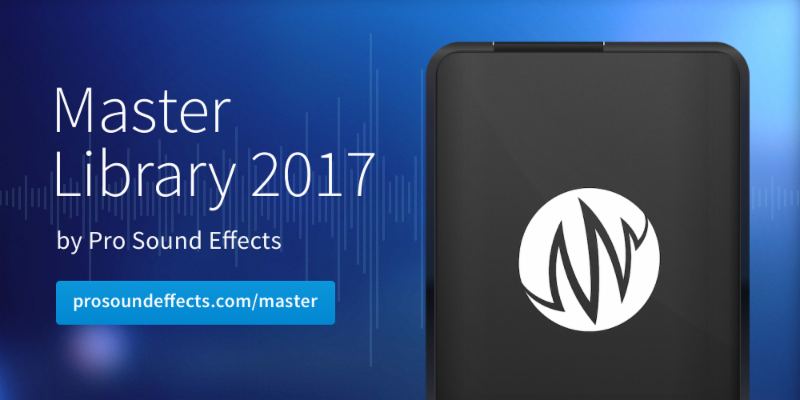 The Master Library 2017 is the most complete sound library for professional media production - designed to include everything you need to deliver great sound faster than ever. Coinciding with the release, the Master Library 2017 is on sale through June 1st at 15% off for companies with buyout or annual subscription options, and 50% off for freelancers. Application for Freelancer Pricing is free with no purchase commitment. "The Master Library 2017 is our flagship general library, and this year we have upgraded it with more than 27,000 world-class sound effects plus search software to make it better than it has ever been," says Douglas Price, President of Pro Sound Effects. "We are proud to unveil and offer our most thorough general library to date that users can rely on to stay in the creative zone, finish projects faster and produce their best sound always." Through June 1st, the Master Library 2017 is available to companies for $9,995 (reg. $11,995), or starting at $2,995 per year for a multi-user license (reg. $3,795 per year). Pro Sound Effects® develops the most useful sound effects libraries for next level media production. Audio professionals in post, games, film and television rely on PSE libraries to fuel creativity, finish projects faster, and produce better sound. PSE libraries span the sonic spectrum, are continually updated and accessible 24/7 online, on drive, and from any computer. Based in Brooklyn since 2004, PSE continues to push the industry forward with the Hybrid Sound Effects Library™, Freelancer Program, flexible multi-user licensing and client-driven library development. Fremont, CA (May 11, 2017) -- ASUS is excited to launch the RX 580 Dual series, an all-new line-up of gaming graphics cards powered by the latest AMD® Radeon® RX 580 GPU. These new graphics cards are capable of delivering HD resolution gaming with ultra-settings, bringing new levels of performance to the market at an affordable cost¹. The ASUS RX 580 Dual series are engineered with advanced cooling and reliability features to deliver outstanding gaming performance. The ASUS Dual RX 580 Series provides the perfect blend of graphics performance and design that is ideal for both VR and esports gaming. Both RX 580 series cards feature 0dB wing-blade fans that spin down completely when the cards are idling or under lighter loads for blissful silence when you’re surfing the web, watching movies, and even playing less-demanding games. You also get dual HDMI 2.0 ports, which is perfect for connecting a VR headset and monitor simultaneously. All models are built using ASUS Auto-Extreme technology, a fully automated manufacturing process that ensures consistent quality. The ROG Strix and ASUS Dual series cards are populated with premium components, and their fans are IP5X-certified for dust resistance. You can rest assured knowing that your investment is reliable enough for the long haul. Each RX 580 Dual series graphics card includes GPU Tweak II for intuitive performance tweaking. With one click, the Advanced mode offers extensive tuning options that allows users to maximize their graphics card performance for an improved gaming experience. The ASUS RX 580 cards also include a 1-year² XSplit Gamecaster license that lets gamers easily stream or record gameplay via a convenient, in-game overlay. ASUS Radeon RX 580 Dual Series gaming graphics cards are available now at leading resellers in North America with suggested MSRP pricing ranging from $209.99 for the ASUS Radeon RX 580 O4G model to $234.99 for the ASUS Radeon RX 580 O8G model. For additional information on the complete line up of ASUS RX Dual series graphics cards, please visit - ASUS USA. ¹ Performance varies between RX 500 series cards, system specifications and settings required for HD resolution or higher at ultra-settings in games. Not all systems will be capable of stated settings. ² 1-year XSplit Gamecater premium license is worth up to $99. ASUS RX 580 cards feature a 1-year premium license, while RX 570, RX 560 and RX 550 cards provide a 14-day premium license.